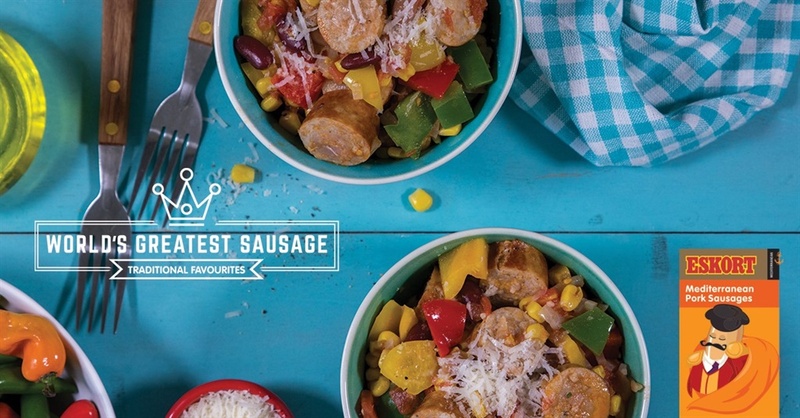 Med-style sausage and beans, quick and easy and super flavourful. As #JustDelicious the next day, if there are any leftovers that is! Heat some of the oil in a pan and fry the sausages until browned all sides and cooked through. Remove from the pan and cool, then cut on the diagonal into slices. Add a little more of the oil to the pan and fry the onion and garlic until the onion has softened. Add the peppers, toss to combine and fry for 2 minutes until just starting to soften. Add the beans, tomatoes, chilli flakes and sweetcorn and simmer for another 10 minutes, tossing regularly. Add the sausages and toss to combine. Remove from the heat and season with salt and pepper. Serve warm with a sprinkling of cheese and a starch of your choice or as is.